Poll results reveal whose 2015 range you can’t wait to see! 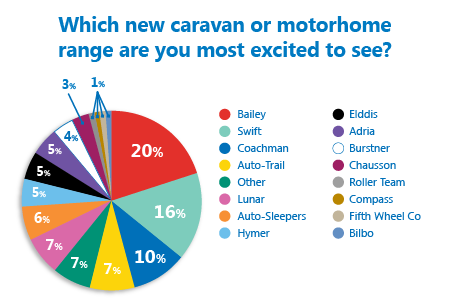 In anticipation of the Motorhome and Caravan Show 2014, last month we asked you to tell us whose 2015 range you were most exciting about seeing. We gave you fifteen caravan and motorhome manufacturers to choose from, including big names like Bailey, Swift and Lunar, and as always there was the option to choose ‘other’. All the manufacturers on the list will be exhibiting at the NEC Show in Birmingham (14 – 19 October), giving you the perfect chance to get up close and personal to the latest and greatest models. Bailey came out on top with 20% of the vote, followed by Swift in second with 16%. Rounding off the top five were Coachman, Auto-Trail and Lunar. “We would like to see the Elddis Explore 402“, said Mr & Mrs Hawkins. Have your say in the comment box below! What’s your favourite motorhome or caravan app? VOTE NOW in latest poll. You can not produce a comprehensive list that is fair, accurate or comprehensive when some of the people in the list have two separate opporunities to poll, because they are caravan & motorhome manufacturers; versus a set of manufacturers that only make motorhomes. This logic is flawed it may make for easier presentation of the figures from your point of view but it is flawed! The only way to get true and ACCURATE representation is to split them. Thanks for your feedback Maurice. We’ll aim to split the voting polls going forward. this cannot be regarded as a true representation of the facts as you failed to separate motorhomes and caravans. Thus giving a false picture, as the ones who won make both caravans and motorhomes.The ones who came last are motorhome only. We grouped the two categories together to provide a more comprehensive list.